Or, at least, part of a kiosk. 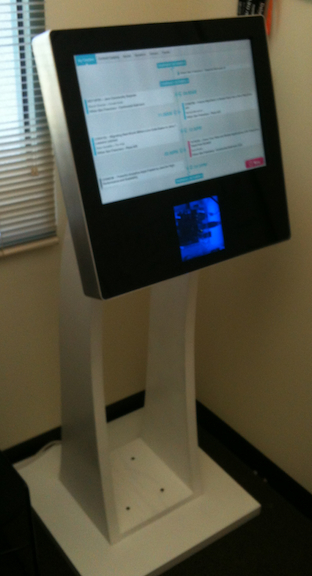 Rewinding a week or two, I was chatting with a colleague at work and he mentioned that he wanted to build a kiosk to show off some software we’ve been developing for the past couple of years at an upcoming conference. Before my brain could interviene my mouth volunteered to help. We kicked ideas around on the whiteboard, he drew up some mockups using a 3D drawing package called Cheetah3D on the Mac. (side note, it looked pretty handy. I’m partial to SolidWorks, but it only runs on Windows and is expensive. 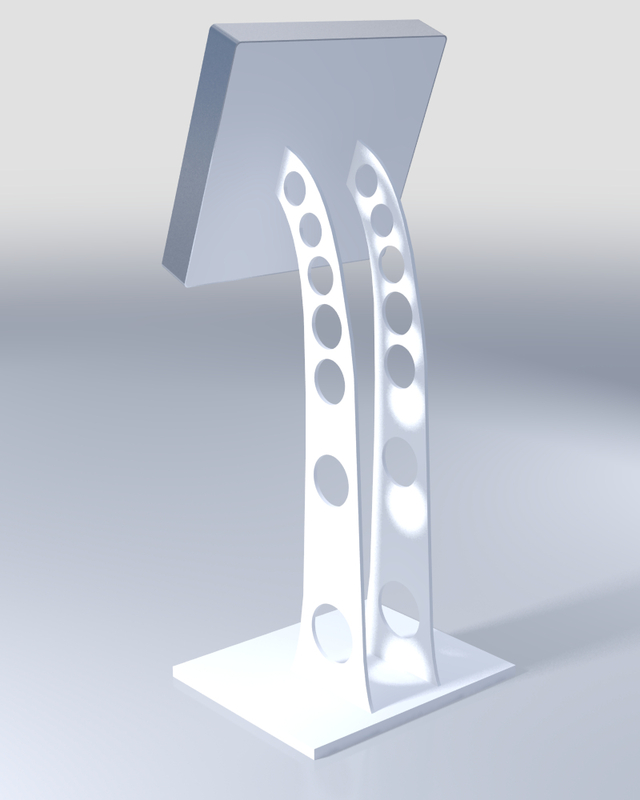 Sketchup is the popular tool for woodworkers.) 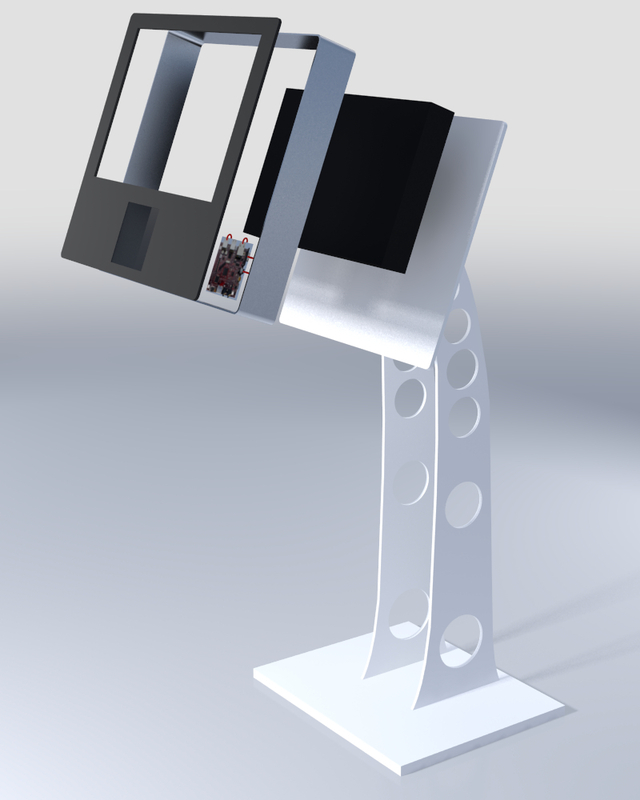 I modeled the kiosk in SolidWorks once we had a decent idea where we wanted to go with it. From that it was easy to generate full-scale drawings that I could print at Kinko’s so we could get a sense of the scale and proportion. The goal was to make something that looked like this. The blank spaces on the legs are for logos and lettering. The interesting bit is the case, which houses a touchscreen monitor and a embedded computer called a Beagle Board. 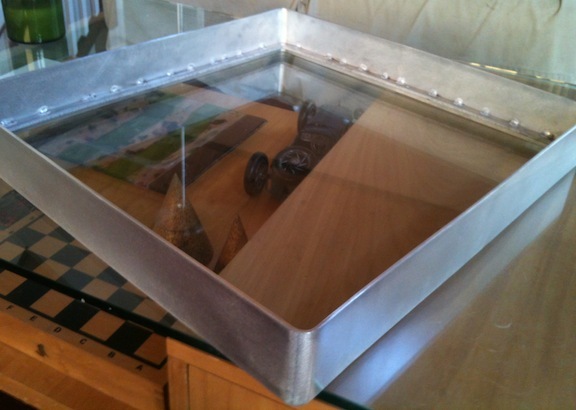 We decided to build a prototype to see what would work and what wouldn’t. My friend did most of the work, cutting out the legs from plywood, routing recesses for the wiring, sanding and painting and assembly. I made the aluminum case surround and internal bracketry. And cleaned up my shop – which took more time than the fab work. We had some “nut rings” – internal supports – laser cut form the DXF files I produced. Honestly, laser cutting isn’t the hot setup for Aluminum. 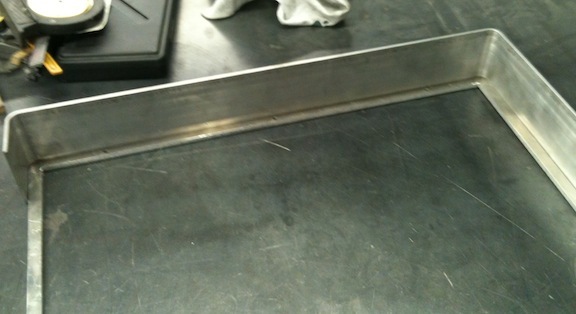 It leaves a ragged edge, waterjet would have been better. But we were on a tight schedule and had to work with whatever places could meet our turn-around requirements. 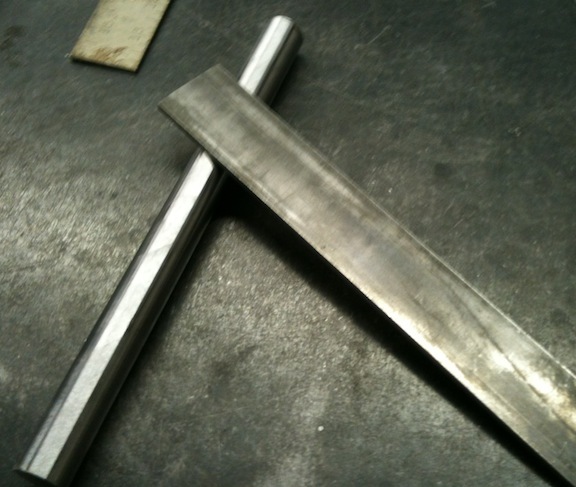 I cleaned up the worst of the ratty edge with a file – but we were working to close tolerances as the acrylic front we had cut needed to fit properly so I had to go easy. I had to make a radius die for my brake to bend the correct .5″ radius for the corners. Here is the first sample bend, looks pretty good. To be able to get the bends where you want them you need to allow for material loss in the bend. 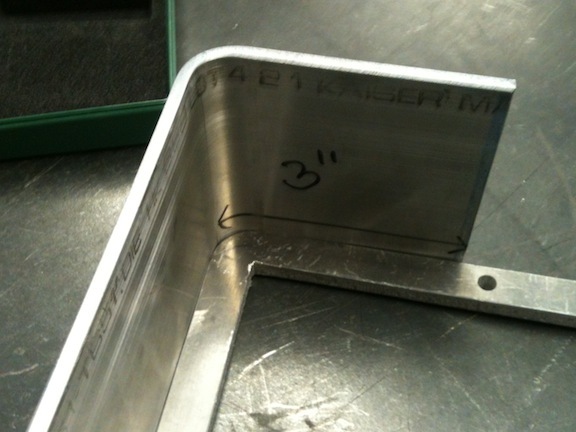 The easiest way to do this is to make a test bend and measure it. It this case I laid out a bend line 3″ from the edge, made the mend and measured from the end to the outside surface of the bend. In this bend orientation I lost about .080″. Note that the bend is a good match to the laser cut ring. Here are the first two real bends, looks pretty close. 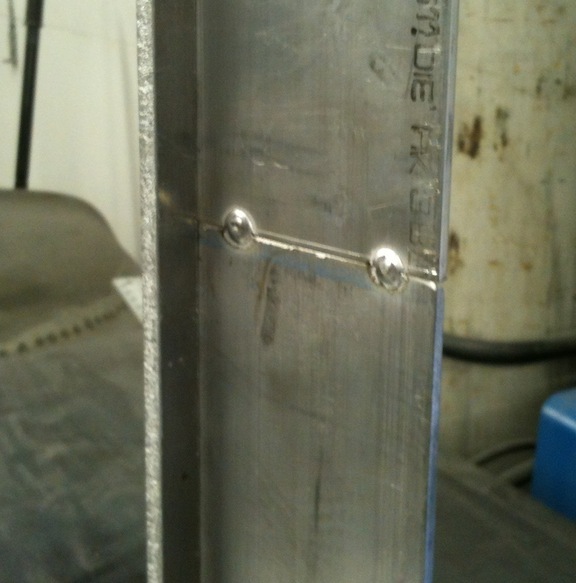 After bending all four corners I had to weld the seam. I tacked it first, then made sure that the fit up at the weld joint as right. The nut ring is not welded in place yet, it’s just held there by friction. I poped it out, welded the seam solid and ground the surround smooth. 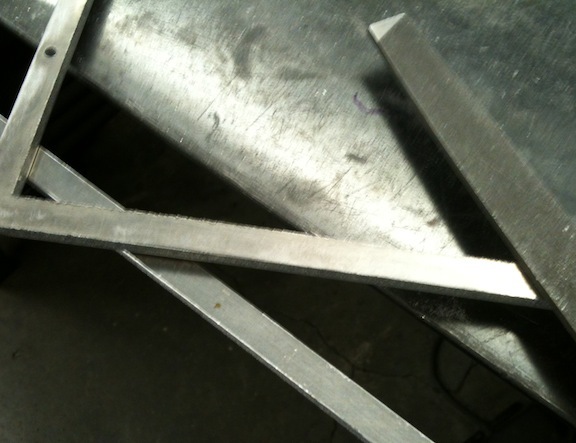 Once I’d erased all traces of welding the surround I welded in the nut ring and passed it off to my buddy. Meanwhile he was sanding and painting the plywood base and wiring up the guts. He decided to punt on the holes in the legs for the prototype, if we actually have a batch of these made for the conference we’ll include the holes.